A Chinese entrepreneur and philanthropist, as founder and CEO of Alibaba.com, he runs one of the world's biggest B2B online marketplaces, an eBay for companies doing international trade. He is the founder and (now retired) Executive Chairman of Alibaba Group, a family of highly successful Internet-based businesses. He is the first mainland Chinese entrepreneur to appear on the cover of Forbes. Born in Hangzhou, Zhejiang Province, China; at an early age, he developed a desire to learn English so he rode his bike for 45 minutes each morning in order to go to a nearby hotel and converse with foreigners. He would guide them around the city for free in order to practice and perfect his English. Later in his youth, although he failed the entrance exam twice, he attended Hangzhou Teacher's Institute (currently known as Hangzhou Normal University) and graduated in 1988 with a Bachelor's degree in English. While at school, he was elected student chairman. He later became a lecturer in English and International Trade at the Hangzhou Dianzi University. He first started building websites for Chinese companies with the help of friends in the U.S. He has said that "the day we got connected to the Web, I invited friends and TV people over to my house," and on a very slow dial-up connection, "we waited three and a half hours and got half a page. We drank, watched TV and played cards, waiting. But I was so proud. I proved (to my house guests that) the Internet existed." In 1995, he founded China Yellowpages, widely believed to be China’s first Internet-based company. From 1998 to 1999, he headed an information technology company established by the China International Electronic Commerce Center, a department of the Ministry of Foreign Trade and Economic Cooperation. He founded Alibaba in 1999; a China-based business-to-business marketplace site which currently serves more than 79 million members from more than 240 countries and territories. In September 2014, it was announced Alibaba was raising $20 billion in an IPO. 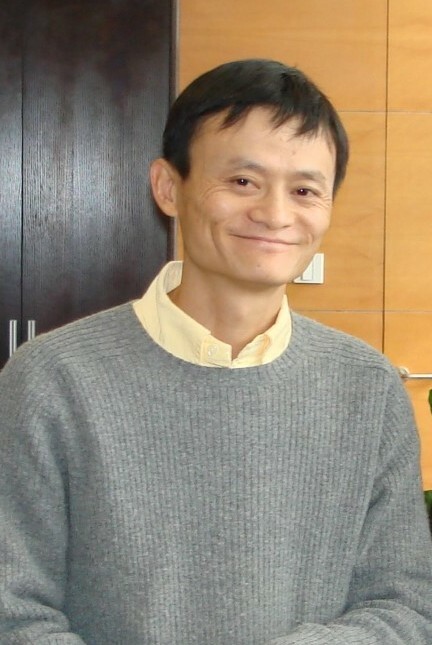 He now serves as Executive Chairman of Alibaba Group, which is a holding company with nine major subsidiaries – Alibaba.com, Taobao Marketplace, Tmall, eTao, Alibaba Cloud Computing, Juhuasuan, 1688.com, AliExpress.com and Alipay.com. In November 2012, Alibaba's online transaction volume exceeded one trillion yuan. He was thus labeled "trillion Hou", meaning literally "Trillion Yuan Marquis" in Chinese. On January 15, 2013, he issued an open letter to employees stating his intention to retire from his post as CEO of Alibaba Group as of May 10, 2013. The recipient of many honors; in 2004, he was chosen by China Central Television and its viewers as one of the “Top 10 Business Leaders of the Year”. In 2005, he was selected by the World Economic Forum as a “Young Global Leader”. Also in 2005, he was named one of the “25 Most Powerful Businesspeople in Asia” by Fortune. He was selected by Businessweek as a “Businessperson of the Year” in 2007 and one of the 30 “World’s Best CEOs” by Barron’s in 2008. In May 2009, and again in 2014, he was honored by Time magazine with inclusion into the Time 100 list of the world’s 100 most influential people. He was also chosen as one of "China's Most Powerful People" by BusinessWeek, and one of the “Top 10 Most Respected Entrepreneurs in China” by Forbes China in 2009. He received the “2009 CCTV Economic Person of the Year: Business Leaders of the Decade Award”. In 2010, he was selected by Forbes Asia as one of “Asia’s Heroes of Philanthropy” for his contribution to disaster relief and poverty. In 2011 it was announced that one of his companies had gained control of Alipay, formerly a subsidiary of Alibaba Group, so as to “comply with Chinese law governing payment companies in order to secure a license to continue operating Alipay. Numerous analysts reported that he sold Alipay to himself below market value without notifying the Board of Alibaba Group or the other major owners Yahoo and Softbank, while he stated that Alibaba Group's Board of Directors were aware of the transaction. The ownership dispute was resolved by Alibaba Group, Yahoo! and Softbank in July 2011. He was awarded an honorary Doctoral degree by the Hong Kong University of Science and Technology in November 2013 and has audited classes at the University of California, Berkeley. He is a board member of Japan’s SoftBank and China’s Huayi Brothers Media Corporation. He became a trustee of The Nature Conservancy’s China program in 2009 and joined its global board of directors in April 2010. In 2013, he became Chairman of the Board for the Nature Conservancy's China Program; this was one day after he stepped down from Alibaba as company CEO. He is the first Chinese citizen to serve on The Nature Conservancy’s board. In 2007, in response to worldwide criticism of the practice of killing sharks for their fins, he announced that he and his family had, "sworn off Shark Fin Soup - now and forever." He has stated that that moment created a newfound interest in environmentalism that would shape his future ethos. In January 2009, Alibaba Group revised its listing policy and banned the sale of shark fin products on all of its e-commerce platforms. At the Alibaba.com Annual Shareholders Meeting in May 2009, he encouraged those in attendance, including shareholders, customers and students from two Hong Kong universities, to take matters into their own hands and take action in the form of starting businesses to cope with the economic downturn rather than waiting for government or business to help them. He reminded everyone that the great fortunes of the world were made by people who saw opportunities that others didn't, and he noted that the aftermath of the recent global recession would be no different in terms of exposing new ways of doing business. At the annual general meeting of shareholders for Alibaba.com in May 2010, he announced Alibaba Group would begin in 2010 to earmark 0.3 percent of annual revenue to environmental protection, particularly on water and air quality improvement projects. Of the future of Alibaba, he has said that, "Our challenge is to help more people to make healthy money, 'sustainable money'; money that is not only good for themselves, but also good for the society. That's the transformation we are aiming to make."